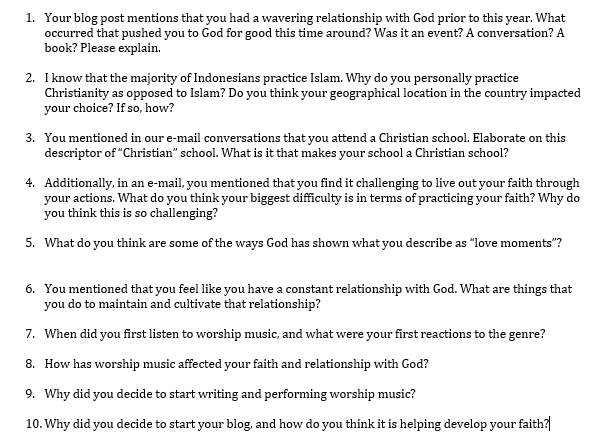 If anyone had told me when I first started this blog and this research task that I would have made a contact with a student in Indonesia, I would have scoffed. It would have seemed so unlikely to me that something so borderless could occur in my life. Alas, I’m glad no one had told me that ahead of time because I would currently be eating my words. I interviewed student Steven Djie, a fellow WordPress blogger, via e-mail on Friday, March 27. I sent him a series of ten questions after having several previous e-mail exchanges about his religious beliefs. My goal was to learn what drew a teenager to be so close to God and so in tune with his faith. Within a few days, I received answers back to the ten questions I had asked, and all were insightful. I know I shouldn’t have been shocked that they came from a 17 year old because I have grown accustomed to reading his well-developed, thought-provoking blog posts, but Steven’s keen eye for understanding at such a young age continues to amaze me. Steven doesn’t attribute his faith or relationship with God to any particular moment. Instead, he attributes it to the work of the Holy Spirit. Being that he is Chinese in Indonesia, as is his family, he feels like Christianity wasn’t necessarily a choice but an aspect of his family history. He develops his faith by attending a Christian school where most of the subjects are studied through a Christian lens. This was something new to me, as I didn’t necessarily know there was a Christian way to study things like economics. In addition to the regular subjects, they have sermon-like lessons and worship sessions at least three times a week. Outside of school, Steven studies the Bible, prays, and listens to and writes worship music. For him, it is a way to write about life and minister at the same time. Many of his friends kept blogs, and for this reason, Steven also started blogging about his faith. Writing the blog has helped him develop and further his Bible study. Overall, Steven feels that his biggest difficulty is approval. He sometime feels conflicted about wanting to fit in with friends and following his relationship with God. He has said, though, that his faith tends to win in these situations. I believe I asked a variety of questions which enabled me to get interesting and dynamic answers. Being that Steven is a blogger, he provided thorough written responses through e-mail. I could also pick up his voice through his writing, much like I can when I read his blog posts. InterViews by Brinkmann and Kvale suggest that one measurement of interview quality is the extent of spontaneous, rich, and relevant answers (192). While I received rich and relevant answers, the e-mail format of the online interview kept the spontaneity at a minimum. Especially after completing successful face-to-face interviews, the unique twists and turns of conversation were absent from the e-mail exchange. This could be simulated more through repeated back-and-forth e-mail messages, though with our time difference and schedules, this level of constant communication was simply not possible. Being that Steven is from Indonesia and a very Christian school, I wonder how possible it would be to generalize his experiences here in the United States. I would like to speak with a high school student from America about their experiences with Christianity and the conflict between a relationship with God and a relationship with friends to see if the struggles parallel Steven’s and seem to be more of a universal phenomenon for teens rather than a singular experience. 1. Your blog post mentions that you had a wavering relationship with God prior to this year. What occurred that pushed you to God for good this time around? Was it an event? A conversation? A book? Please explain. You know I think that everything that I am and have become is all the work of the Holy Spirit. It really isn’t my doing or my desire for God. No one desires God (says Romans). So i’d have to say nothing new/different occurred to me that really made me draw closer to God. Because always, it’s the work of the Holy Spirit Himself. But I guess what’s harder is not maintaining the relationship itself. I think what enabled me to really maintain the relationship is because I have decided to deal with certain sin-strongholds that I’ve held on for years. 2. I know that the majority of Indonesians practice Islam. Why do you personally practice Christianity as opposed to Islam? Do you think your geographical location in the country impacted your choice? If so, how? My family is Chinese (race). In Indonesia, the people who practice Islam are mostly native Indonesians. The Chinese people usually practice Christianity and Buddhism in Indonesia. It is very rare to see a Muslim Chinese Indonesian. I don’t think my geographical location really impacted my choice. It’s all family. 3. You mentioned in our e-mail conversations that you attend a Christian school. Elaborate on this descriptor of “Christian” school. What is it that makes your school a Christian school? My school adapts a classical education-approach. For the maths, english, sciences, we use Cambridge curriculum, which is the most popular curriculum used in Asia aside from International Baccalaureate (IB) <– maybe since you’re teacher you’d know that. But we have subjects such as History and English Literature which we don’t use the Cambridge curriculum. We study Lit and History and Indonesian Civics from a Christian approach, connecting with Biblical principles etc. Every morning we’d have ‘Chapel’. It’s like homeroom. We would have a praise and worship time. Then, a Christian teacher would teach some Christian values, almost like a sermon in church. This year, the theme is the Ten Commandments. So, each commandment is the topic of the chapel time for one whole month, with the exceptions of special times such as Christmas or Easter. 4. Additionally, in an e-mail, you mentioned that you find it challenging to live out your faith through your actions. What do you think your biggest difficulty is in terms of practicing your faith? Why do you think this is so challenging? The biggest difficulty is the approval idols. I want to do good, but sometimes with the perverted friends that I have, it’s hard to do it. It’s all about approval. I’m a normally introverted person, and I tend to seek approval a lot. But I’m trying to kill those idols. 5. What do you think are some of the ways God has shown what you describe as “love moments”? I’m teased a lot at school. Sometimes my friends can get pretty annoying. And, in these times, I can still feel God’s protection. I can feel His assurance of deliverance. I can hear Him say that I am enough and that I don’t need to prove anything to be accepted by anyone. It’s those moments where God reminds me of His love. God is everywhere in my life. 6. You mentioned that you feel like you have a constant relationship with God. What are things that you do to maintain and cultivate that relationship? Reading the Bible, praying, praise&worship through songs. Those three things are a must for me. Most especially reading the Bible. I think reading the Bible and praying is so important. 7. When did you first listen to worship music, and what were your first reactions to the genre? I’ve always known worship music. As I said, my school holds praise and worship every morning for 3 days a week. But in the past I never liked them, not because they did not sound musically good, but because I thought it was so pious and weirdly religious. I think worship music reaches to the heart and if one doesn’t open up one’s heart to hearing His voice, one wouldn’t enjoy worship music at all and would try hard to avoid it. 8. How has worship music affected your faith and relationship with God? You know worship music should never be a replacement to Bible reading. That’s what I learned. Worship music is written by people so its not and will never be the Bible. Worship music can only ‘minister’ to people. I guess at a certain degree, it helps make me feel God’s love and presence more. But not the same as when I read the Bible. As for the Worship music I write, like all the things I write, I hope to convey a message that will bless and minister to others when I sing it to them. 9. Why did you decide to start writing and performing worship music? I’ve always been intrigued in writing songs. Taylor Swift is one of my favorite artists of all time, and she is a singer-songwriter who writes all of her songs based on her personal life. i’ve always been inspired by her. And, as for writing worship music, it kind of just came to be. I had a conversation with my cousin who also writes songs and she said how songs always convey a message and should not just be like a diary. That really inspired me. So I started uniting both my life experiences and the message I wanted to convey to people so that people can both relate to it and at the same time be ministered. 10. Why did you decide to start your blog, and how do you think it is helping develop your faith? A lot of my friends have blogs. I’ve always loved writing, ever since I was a kid. I’ve always had a lot of things in my mind. And I knew that I need something to just pour my thoughts out on. So I created a blog. Its definitely helped remind me of for example verses that I would typically forget after several weeks or so.